Only Cardiff striker Eoin Doyle has scored more goals in England than Harry Kane this season. Harry Kane may have ended on the losing side as Liverpool won Tuesday's Anfield thriller, but he is still the goalscoring gift that keeps giving for Tottenham - and for England manager Roy Hodgson. Kane could not engineer another win for Spurs, as he did with his double under the gaze of Hodgson in the 2-1 win against Arsenal in the north London derby at White Hart Lane on Saturday. And yet, even on a night of disappointment, he still showed his quality and growing maturity by scoring his 23rd goal of the season and setting up another for Mousa Dembele as Spurs went down 3-2 to Mario Balotelli's late goal. Spurs fans sing of Kane as "one of our own", but he could soon belong to many more too. It seems a formality that he will graduate to full England honours when Hodgson names his squad for the Euro 2016 qualifier with Lithuania and the friendly in Italy at the end of March. So, what is behind his remarkable rise - and will his promotion to the full England ranks be as simple as it sounds? Despite the defeat, Kane's performance at Anfield was another perfect example of the hot property Spurs, and imminently England, have on their hands as he scored one goal and set up another. Kane demonstrated he does not simply enjoy the glory game. He had an early penalty shout turned down when he chased down a ball with Liverpool keeper Simon Mignolet then tried an ambitious shot from the halfway line. The 21-year-old striker is bursting with confidence, taking his equaliser with expertise from close range then reacting quickly to set up Dembele after Mignolet saved Christian Eriksen's free-kick. These aspects of his game are well known but Kane is a player never shy of looking for work, dropping deep or wide to make himself available and while he did not win all the physical challenges with Liverpool's Martin Skrtel, he never backed off in a tough battle. Kane can play through the middle as a lone striker but he has strengths in other areas, with his hold-up play and close control also impressive at Anfield. Another sign of his growing stature was the anxiety felt around Anfield when he had the ball in dangerous areas. Liverpool's fans know he is a force to be reckoned with. He cut a contrast, here at least, to the returning Daniel Sturridge, who was lively enough in a performance that would have delighted Liverpool boss Brendan Rodgers as well as Hodgson. Sturridge was quicker and more direct that Kane, but the Spurs striker has such a well-rounded and versatile game that they are two players who will widen England's dimensions when Hodgson considers his next squad. Kane signed a new five-year contract with Spurs at the start of February and seems certain to have an England call-up - but he has had to take several detours before arriving at this destination. The young striker's brief time at Arsenal as a child has been well, and mischievously, chronicled but he arrived at Spurs as an 11-year-old after a short spell at Watford and is now paraded as a symbol of the club's youth development strategy. It has not, however, been all plain sailing and it is a tribute to his determination and desire that the profile he enjoys now comes after less-than-spectacular loan spells at Leyton Orient, Millwall, Norwich City and Leicester City between 2011 and 2013. Kane hinted at what he had to offer at Millwall with seven goals in 22 games as well as five in 18 at Orient. He suffered injury at Carrow Road and after his stint at Leicester it was back to Spurs. "I have known Harry Kane for a very long time," former Spurs manager and director of football David Pleat said. "His feet are firmly on the ground. He is a very sensible boy, a modest, humble boy. "He had injury problems, he had a loan at Leicester where they had about seven forwards vying for three places and he had a loan at Norwich where Chris Hughton, who was manager at the time, says it didn't quite go for him. "But in previous loans at Millwall and Orient, I went to watch him. He was very good at Millwall but he played a very different game. He played purely as a front man with his back to goal, as an old-fashioned traditional centre-forward and they were playing off him." 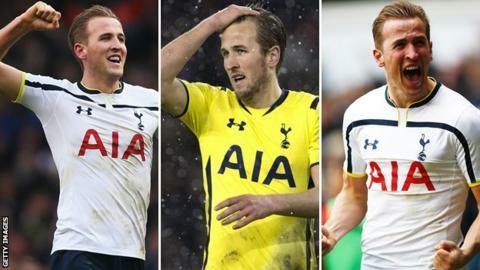 Former Spurs and England striker Clive Allen, who was on the White Hart Lane management team as Kane's potential developed, said: "I saw him walk through the door as a 16-year-old and had the pleasure of working with him for four years while I was on the staff and he was a fine young man. "You could see from the day he walked in he had a real desire to improve himself as a footballer and the one thing I'd say about him, which unfortunately you don't say about a lot of young footballers, is that he had a passion for the game. He loves football, he loves playing, he loves scoring goals." On current evidence, it would appear one of the easiest selection decisions of Hodgson's time as England manager to put Kane in his next squad in March. Kane scored six goals as the England Under-21 team qualified for this summer's European Championship in the Czech Republic - but some are tipping him for a much more senior role. The England contenders - who's in form? Former Spurs and England midfielder Danny Murphy, now a BBC Sport pundit, told Match of the Day that Kane must not just be included in the senior squad - but become the central figure. "Not just selected but in the team - and build the team around him," Murphy said. "He's so young, but he's so powerful. I'm struggling to see a weakness in his game." Even amid the pain of a derby defeat, Arsenal manager Arsene Wenger was able to praise Kane - and unwittingly send a warning to Hodgson. "When you have scored the number of goals he has scored, if you don't put him in there somebody else will give him a passport," the Frenchman said. Kane has represented England at all levels from Under-17 to Under-21 level but is eligible for Republic of Ireland through his father. The speed of Kane's development can be underlined by the fact he did not make his first Premier League start under Mauricio Pochettino until the home defeat by Stoke City on 9 November - although there had been growing demand from Spurs fans for his inclusion after scoring eight goals in his previous eight games in all competitions. Since then, there has been no looking back and on a transfer deadline day short of big news, Kane's fresh commitment to Spurs was arguably the most significant development. He will be one of their own for some time to come - but Hodgson will also surely want a piece of the action. How would he fit into England's plans? Wayne Rooney is the constant factor in Roy Hodgson's set-up but the rise to prominence of Kane adds to his embarrassment of riches. Now can he find a way to utilise them? In the current Euro qualifiers, Hodgson has used Liverpool's Raheem Sterling at the tip of a midfield diamond while Danny Welbeck - so trusted by England's management team - has five goals in qualifying so far and has had success as a striker and also playing on the left flank. Daniel Sturridge is coming back to fitness, while West Bromwich Albion's Saido Berahino has had a taste of the England squad. Burnley's Danny Ings and QPR striker Charlie Austin have their supporters. Rooney's current deployment in central midfield may add a string to England's bow, although he prefers a striking role and now stands only three goals away from Sir Bobby Charlton's record of 49. There seems little logic in employing him in central midfield for Manchester United, let alone England. The beauty of Kane is his ability to play as a lone striker, as well as a well-rounded game that fits well with dropping deeper - but he may struggle to get in ahead of the successful Welbeck, while Sturridge will hopefully be back firing by the end of March. "I think you could play Harry on his own with players deeper with a five-man midfield and Harry leading the line because I think that's his best position," Allen added. "He's played in a number of positions for Spurs, a little bit withdrawn and deeper, but when he leads the line, when he's a traditional number nine, that's his best role and I think eventually that will be the role he will play for England." Pleat is an admirer of the all-round attacking versatility Kane offers - and which will put him in the frame for a full cap. "At Tottenham he has definitely come deeper, he has joined in more, he has proved he has good feet - I am talking now about passing ability not goalscoring ability - so he can come deep and link with other players," Pleat said. "Because he runs at people from a deeper position he looks quicker, shall we say, than he really is, which might sound strange but the defenders are on their heels when Harry picks the ball up and he goes at them. This is something he has learned, picked up from coaches, and he has done it very well." Pleat revealed Spurs keeper Brad Friedel told him that in "passive practice", when there is no opposition in training, he is the best finisher at the club. "That is another thing about Harry Kane. He is a two-footed player and how many strikers are two-footed players? He can get goals from the left or right side. He is first class." So he will have stiff competition and England's manager will need to somehow fit him into his plans with Rooney, Sterling, Welbeck and Sturridge - but what is there for Roy Hodgson not to like about Harry Kane?